Stations and cards. Cards and stations. These, I admit, are two of my favorite things. I love using cards — whether for sorting, to make observations, or as discussion starters — to help students develop understanding of science concepts, and instituting “stations-based learning” (pretty sure I just made that phrase up) in my classroom was a gamechanger. I have found that stations promote student ownership of their learning, because activities are typically student-centered and hands-off. Depending on how you use them, they often require self-pacing and collaborative work, and you can easily differentiate as needed. I have several blog posts on integrating stations into your science classroom (check those out below) but what I really want to talk about today is an activity that utilizes both stations AND cards. Before we dive into that, let’s chat about cards. So cards — cards in your science classroom can be super simple (think: one picture or one word) or complex and full of information (think words, pictures, AND web links!). What you include really depends on the learning objectives of your activity. When I introduce biotic and abiotic factors, I often use cards with a single word: bacteria, precipitation, grass, sticks. If I want to differentiate for English Language Learners (or really anyone who may struggle with language), I might use a picture instead or in addition to. These are very simple cards, and they don’t take long to put together. Students are given the cards and asked to sort them into categories. Because it is an Explore activity, I don’t tell them the categories. I let them work it out, and typically we get to the idea that we can have a “living things” group and a “non-living” group. We dive into complexities like “Where do sticks fit? What about a dead tree trunk?” and then apply some science vocabulary to wrap it up during the Explain phase. But anyway, super simple card sort, and the students figured out the concepts all on their own. Way better than a slideshow lecture and notes. On the other hand, I have other activities where students use much more complex cards to make observations from images or visual data, read about examples, explore websites for more information, complete simple or elaborate tasks… and so on. These cards may be used to develop understanding, expand their knowledge, or even assess performance of practices or skills. These cards obviously take more time to put together. My Changes In Ecosystems Card Set falls into this latter category. Ecology is one of my favorite topics to teach — Environmental Science graduate here! — and I love using real world environmental issues to add authenticity to my Ecology unit (or really wherever I can tie it in!). I have found that my students, especially my middle school students, were always more engaged when learning about issues that very clearly mattered — water quality, biodiversity decline, invasive species. If they could see the connection to their lives — the water they drank, the food they ate, the cute fuzzy bees that would be no more — they were all about it. And so I framed my units using these topics, engaging students in citizen science projects like water quality testing or service-learning opportunities addressing invasive garlic mustard. In fact, I used these strategies at both the middle and high school levels successfully — from fifth through twelfth grade! By the time my students finished their Ecology unit, they were pretty well-versed in a number of the day’s environmental issues, and I found that I wanted to see what they thought about it — and how well they could apply their understanding of ecology concepts to these real-world issues. Thus, I created my Changes in Ecosystems card set. While I originally intended the card set to be used as an Elaborate or even Evaluate activity, I found that some of the cards worked well even in the Engage stage, especially if students already had some background knowledge of the topic. That said, I also structured the cards to provide web resources to expand understanding, so the content was accessible to really all levels. And at the Engage phase, it doesn’t really matter what they think – just that they start wondering, connecting the content to what they know, and asking questions. It was also a great way for me to identify misconceptions that students may have held. When I first used this activity, I had students discuss the cards at their table groups and then presenting their cards and ideas to the entire class afterward. In subsequent years, I tried out rotating the cards (so that each group discussed several cards within their small groups), rotating individuals in a jigsaw manner (so that students created new groups with students who had discussed other cards), and even using the cards as a reflective writing piece (where students simply recorded their ideas and turned in their responses). 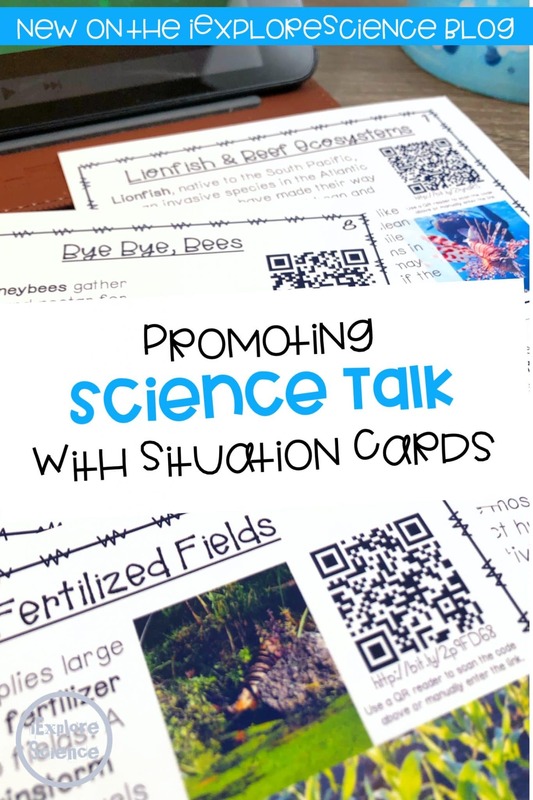 While I do value incorporating writing into the science classroom, I will admit the strategies that promoted student talk led to much more interesting ideas and connections than simply using the cards as a “question and answer” type of activity. Cards are a great way to introduce (or review) many examples in a short period of time, and I found the discussions that were fostered by these cards were so much more valuable than any review game or worksheet I could have created for my students. Engaging them in higher order thinking activities that asked them to make connections, predictions, and apply ecology concepts definitely helped them solidify and expand their knowledge, prepare for the assessment, and simply engage more fully with the content.